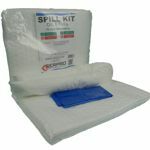 Serpro diesel spill kit - For a fast and safe fuel cleanup. 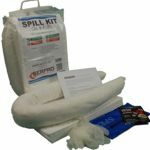 A Serpro Diesel Fuel Spill Kit contains all the materials you need for a fast and safe cleanup. These kits contain hydrophobic absorbents that will only absorb diesel, oil and petroleum - or other hydrocarbon-based products - while repelling water. Ideal for use on dry land and bodies of water like streams, harbors, rivers and other waterways. Diesel spills can have a devastating effect on our environment. Walking on diesel spills can be a slip and accident hot-spot causing people to injure themselves.